Ah! Hello, please, be my guest, take-a seat! You must have some of our wine-a, it's the very finest - no, really, I insist. Cigar? No, ah, you don't know what you're missing. Now, shall we get to business, huh? 'Dis here is my nice-a little passion - my family business. We like-a the nice things in life; we play poker, smoke-a cigars, we shoot and terrify people and love-a to let our hair down. È affascinante. So what-a you waiting for? Why not you get involved, huh? 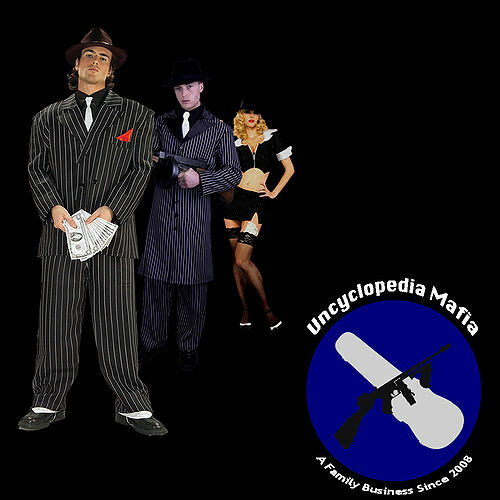 If you're already one o' da boys, den why not starta to enjoy the mafia life-style? Go ahead! If you're not already a-member, you should be ashamed of yourself! Why don't you enrol? In my mafia there lots-a perks - a members only bar, a shooting range and a golf-a course! Seriously, though, you either-a enrol or you sleep wit' teh fishies; your choice. I really don't wanna havva make Johnny, do it, see his mumma just died and he's real sad about it. He's a real nice guy, a real gentle, like - I wouldn't wanna havva make him do it -see? This page was last edited on 18 May 2009, at 18:16.